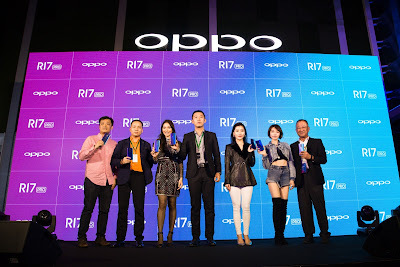 As for the camera department, the Oppo R17 Pro equipped with triple rear cameras. The main camera is a 12MP + 20MP sensor with a smart variable aperture of f/1.5 and f/2.4 as well as OIS (Optical Image Stabilization). The third camera is a TOF (Time of Flight) 3D camera for distance sensing. 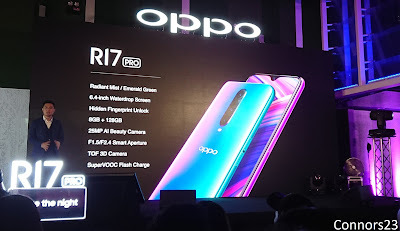 The rest of the specs included a 25MP selfie camera with f/2.0 aperture, 8 GB of RAM, 128 GB of internal storage and run on ColorOS 5.2 on top of Android 8.1. The R17 Pro has a 3,700 mAh battery that features Super VOOC Flash Charge technology that charged the battery from empty to 40% in just 10 minutes. The Oppo R17 Pro retails for RM2,699 and will be available for pre-oder from 23 November 2018 onwards at Oppo Official Concept Store as well as Celcom Blue Cube, Senheng and senQ or online at Lazada, 11Street and Shopee. Every pre-order customers will be receiving a complimentary Olike Neo Sportband value at RM389.